The Institutional Archive recently took in some records and artefacts from the Students’ Union. These older records help to fill a gap in our understanding of the Union and the variety of items help us towards building up a mental image of student life in the past. They include minute books dating from the 1930s to the 1960s of the Union General Meetings, the Executive Committee, the House Committee and, charmingly, the “Dance and Entertainments Committee” who organised weekly balls for students which were held on Saturday evenings. The minutes of the Student Representative Council from 1959 contain interesting discussions about the Union’s stance on Apartheid in South Africa: there was a South African student on the Committee who is given an oar as a symbol of freedom, along with a pledge of support to South African students. 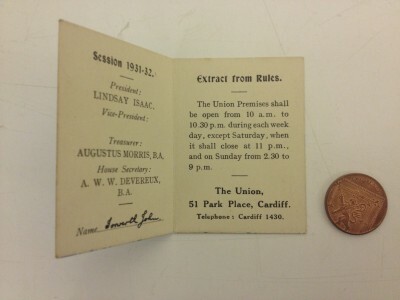 The minutes tell us about the management and day to day running of the Union during these years, something which we previously knew very little about. 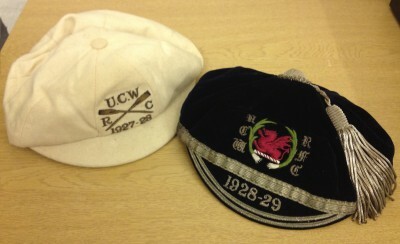 Aside from the minute books, also included are some other items of memorabilia, including University College Cardiff and UWIST (University of Wales Institute of Science and Technology) rugby shirts from the 1970s and 80s. There was also two sporting caps dating from the 1920s, one for the Rowing Team and the other from the Rugby Team. These records fit nicely alongside an accession which the Institutional Archive was gifted some years ago of by a former student. 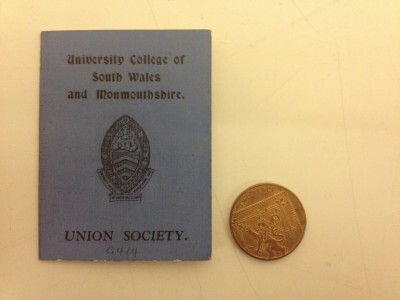 This collection, dating from the early thirties, includes such little treasures as his Student Union Membership card and programmes for the Union societies which he was a member. Items such as this can easily be regarded as ephemera and lost for ever, so it is lovely that we have examples of these everyday items which can help us to build up a mental picture of student life in the early 1930s. 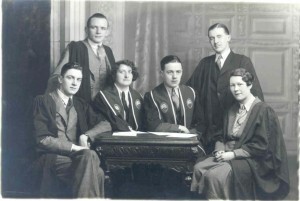 They also fit alongside some photographs we hold of the original Students’ Union building and the Students’ Union Officers, both from 1933. We’ve enjoyed working more closely with the Students’ Union recently, working together on projects such as #VintageCardiff. Projects such as this help to raise students’ awareness of the University’s interesting heritage and have also meant that staff in the Union were aware of the Institutional Archive’s ability to preserve these invaluable records.